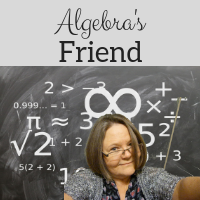 Lisa wrote this blog post recently on using less direct instruction in math class. The math community online often blog about the discovery activities, the explorations, the big activities. But often we don't discuss clearly how direct instruction and those activities are intertwined. We discuss even less the day to day details when we are working on the ordinary, the nitty gritty! I had hoped my 180 blog would have more depth, be more reflective, even about the ordinary days but I find that really difficult. One of my goals is to learn how to reflect better on those ordinary days! I structure my class typically one of two ways. After our warm-up or knowledge check, I invite students to engage in a short discovery activity. I follow that up with specific notes and then additional practice. The other structure I use is starting with notes first and then group practice that has a self-checking mechanism built in. Finding short discovery activities is a challenge. I am learning to use Desmos as we explore each of the required functions in our curriculum. Setting up an exploratory activity to identify transformations on Desmos is easy and engaging! Each spring, the nation’s top 64 college basketball teams are invited to play in the NCAA tournament. When a team loses, it is out of the tournament. Complete the following on your own. How many teams are left in the tournament after the first round? Create a table to show the number of rounds and the number of teams left at the end of each round. How many rounds of games must be played? Graph the points from the table on the grid below. Examine the graph. Is the function linear? Quadratic? Other? Be ready to explain. If the table was extended indefinitely, what would happen to the y-value? After students worked on this activity for just a few minutes, I asked them to share their work with their table groups. I asked students to specifically discuss #5. Then I asked groups to share their description of the graphs they created. Their descriptions were the lead-in to my direct instruction about basic attributes of the exponential function. Use this activity to prepare to explain how a, h, and k affect the exponential function. You can also view other bases; I used 2, but you could use any other number! After completing the basic transformations, try creating equations with multiple transformation on your own. Record your work. After exploring the effects of a, h, and k, and discussing their results with their partners, I pulled the class together again to emphasize a few key points in the form of direct instruction. Students took notes. 1) Given the function 2(x+4)-3, write the new equation if this equation were translated up 4 units, left 1 unit and vertically compressed by 2/3. 2) Given the function (1/4)(x-2) + 5, write the new equation if this equation were translated left 3 units and down 1 unit. 3) Given the function -3(x -7) – 2, write the new equation if this equation were reflected across the x- axis, translated right 3 units and up 3 units. On the next day we started with notes, learning to differentiate between exponential growth and exponential decay. I demonstrated how to solve problem situations involving exponential functions using graphs. The notes were short/sweet. I then gave students problems to solve as partners. We used a similar format to introduce logarithms. Instead of a problem situation to create the first graph as in the March Madness example, we used the concept of inverses to invite students to "discover" the basic attributes of the logarithm function. The process was similar - next we went to Desmos to consider the transformations. And last we worked on problem solving using graphs and tables. Weaving in and out of short discovery activities, following up with notes and practice seems to be effective. I do have some students who want me to give them notes straight up without having to grapple with the math first. They were quite clear about that in my first semester reflection piece. And I understand that they feel tentative and are fearful of making mistakes. It is for that very reason I don't give up on providing short discovery activities. I like the guided questions that you provided for the exponential function. I wonder if this is a function that they were already familiar with. If so, the NCAA question and a table of values should lead them to think about powers of 2 pretty naturally. Do you have the privilege of having each student at their own computer to explore with desmos? Hello! The lesson I described was an introductory lesson to the exponential function in Algebra 2. My students should have seen the function at least briefly in Algebra 1 but I don't know that they did. Yes - we do have a 1:1 initiative in grades 9 and 10 only. All students are issued a Dell computer and carry it to every class. It is a real benefit to us! Do you have the "next day notes" or the log activity on a different page? Hi - I'm not sure what you are looking for. I do have some notes activities and log activities. I might be able to help if I know more clearly what you are looking for. Email me at algebrasfriend at gmail dot com. Or checking my online Filing Cabinet Algebras 2 (a tab at the top of this blog).